Would you think that sitting at a desk job year after year would be more harmful to your health than smoking a pack of cigarettes a day for over 20 years? While it may seem odd to consider this novel idea for a workstation at first, most people who try it love it and wish they’d switched to this type of idea much sooner. Unlike fast-paced workouts on the treadmill, using a treadmill in a work environment (whether in your home office or at your job away from home) is slower paced. Treadmill walking rates are roughly 1-2 miles per hour which is slow enough to carry on phone conversations or conversations in person. It’s also enough to not work up a sweat or become short of breath. However, even at this so-called “snail’s pace,” the miracle is that you can burn up to 150-200 calories per hour. Imagine the benefits of an 8-hour day at a treadmill workstation. For basic reading tasks, some people crank up the speed to 2-1/2 miles per hour. If you were doing other more complex tasks, 1 to 1-1/2 miles per hour would be sufficient to accomplish them. Still others such as writing or calculating might require the user to pause the treadmill and turn the walking desk into a stand-up desk. The possibilities of course are limited only by the dexterity (and coordination) of the user. What are the Benefits of a Treadmill Desk? Aside from the fact that walking workstation users are getting exercise, they’re also stimulating their brain by increasing blood flow. 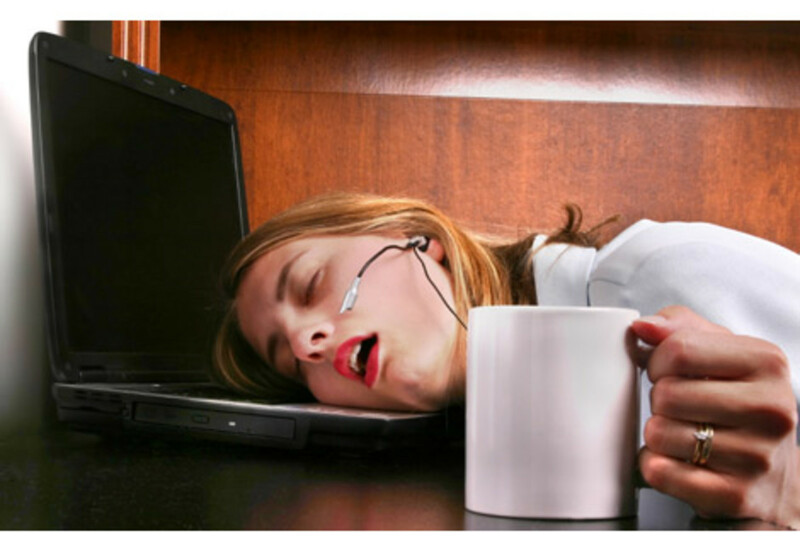 It’s estimated that most people with a sedentary job sit 50-70% of their day. Most then drive home (more sitting) and spend another couple hours sitting down doing something else – like watching TV. Gone are the days when people had to grow their own food or work in the fields where they got exercise naturally. 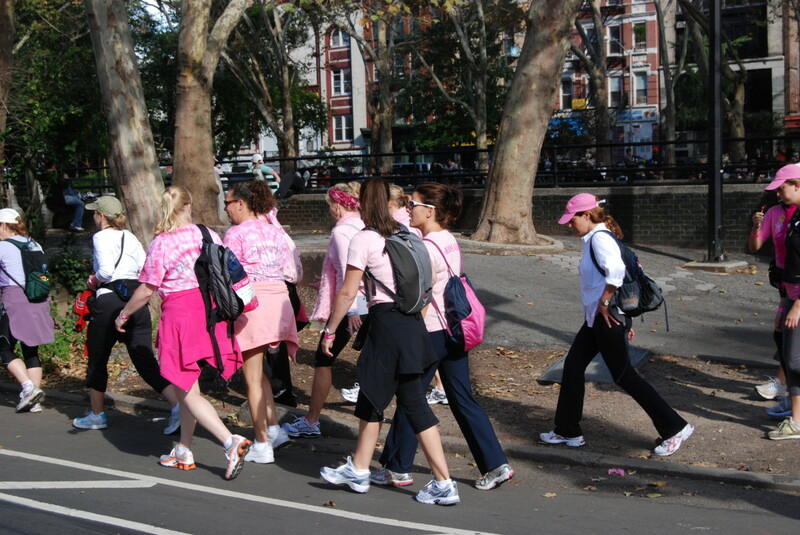 More disciplined folks squeeze in a gym routine or may incorporate exercise into their daily routines. However, most folks are just too tired at the end of the day and have too many responsibilities to give exercise the priority it deserves. Add to the discipline of making time for exercise, sometimes the cost of joining a gym or exercise group is prohibitive. While some gyms may have affordable monthly fees, some are exceedingly expensive, tacking on additional fees and charges if for instance you pay by the month or you have unlimited usage. It’s not unusual to pay $800-1000 per year for a gym membership and sadly, most people do not even use it that much to justify the cost. The benefits of already putting in a workout before you ever hit the front door are a huge plus for this alternative to traditional workstations. This elevates multitasking to a whole new level, being able to get your work done as well as get in daily exercise "at the office." A walking workstation means less pressure on your back and nerves. It leads to less flab around the middle and poor postures. It leads to better circulation, thus cutting down the risk for diabetes mellitus or peripheral vascular disease as it increases circulation to the lower extremities. 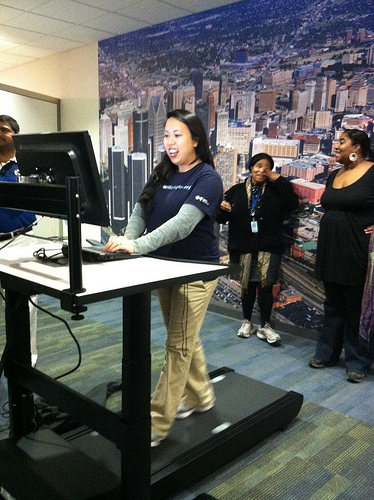 Treadmill desks also encourage proper breathing techniques and proper ergonomics. It of course also encourages proper shoe wear as most people wouldn’t walk on a treadmill in high heels. 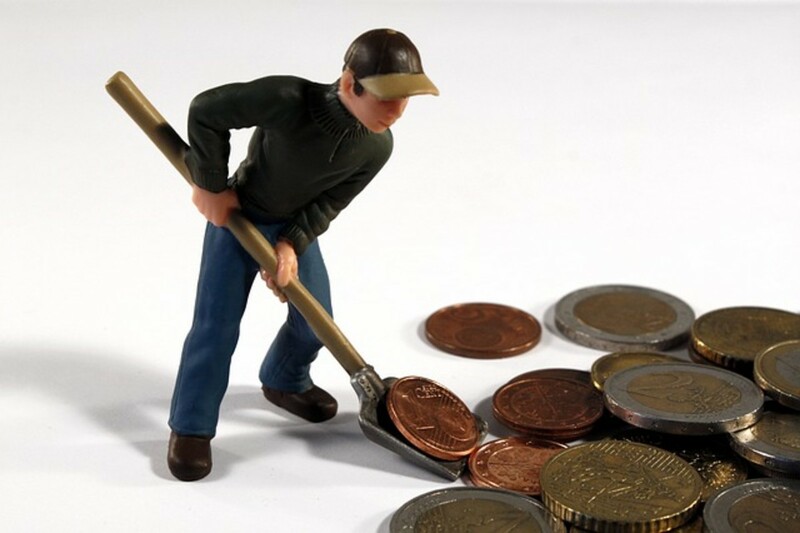 While this may sound unaffordable, users have claimed that they have saved that much and more in terms of medications, surgical procedures necessitated by sitting constantly such as spinal injections or spinal surgeries not to mention fitness costs. If you consider that just 1 year of membership in a gym could run you $800-1000, a walking desk could be paid for in that length of time and instead of renewing a membership, the desk would be bought and paid for and the workstation owned and used for years. There are plans on line for building your own treadmill workstation. 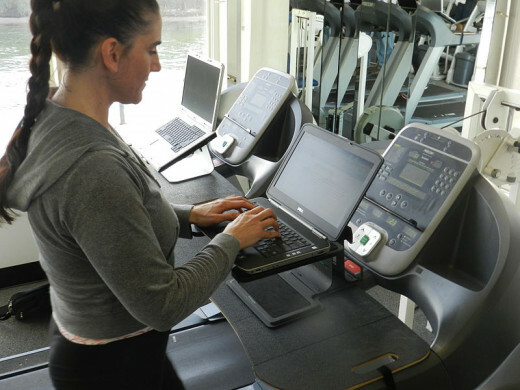 The only word of caution there is that most walking workstations are built specifically for the slow speeds required with a treadmill used for this purpose. However, simple is sometimes better and as the video below shows, you can build your own treadmill workstation with nothing more than a piece of shelving and 2 brackets! If you decide to purchase a treadmill workstation, look for some of these options. For instance, many come with whisper quiet motors so as not to disturb anyone else in the workplace if your job is out in the "real" world. Belts are designed specifically to withstand slow speeds and many will not go above certain low miles per hour. 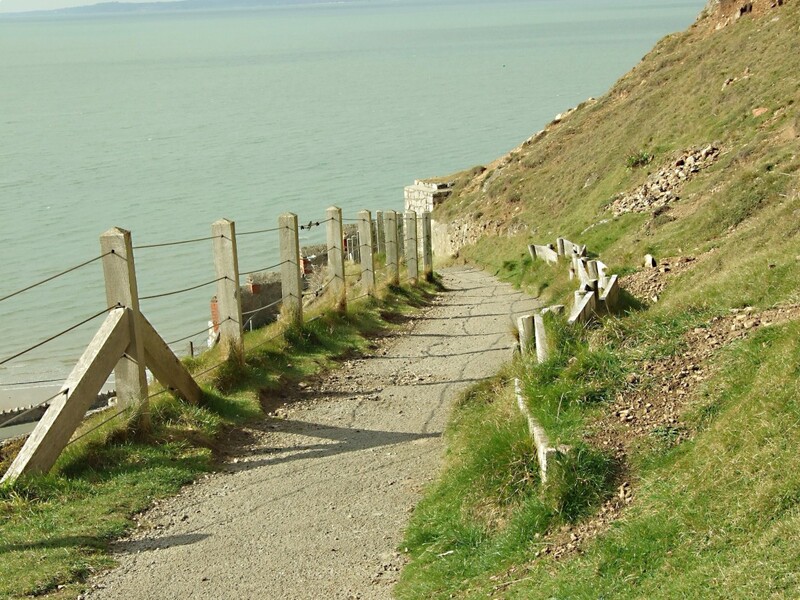 Motors are also designed to accommodate greater weights for longer periods of time than regular treadmills. Keypad heights or level surfaces are specifically designed to accommodate the walking treadmill whereas homemade varieties might not be ergonomically as sound. Beware of creating new problems such as tendon issues trying to save money and make your own workstation. Work surfaces are also designed on professional models for optimum reach space. Most models have many different height adjustments, making a walking workstation ideal for people basically of any height. Some models display calories, miles per hour, distance walked, etc. so the amount of exercise can be tracked. Who Came Up with the Walking Desk Idea? Dr. James Levine, an endocrinologist at the Mayo Clinic was credited by The New York Times for the inspiring idea of the walking work desk. He was doing a study on nonexercise activity called thermogenesis and used a bedside hospital tray perched over a $400 treadmill for his experiment. In 1996, Dr. Seth Roberts, Professor of Psychology at University of California at Berkeley formally designed a treadmill desk and is claimed to be the first official user. Is A Walking Desk Right for You? 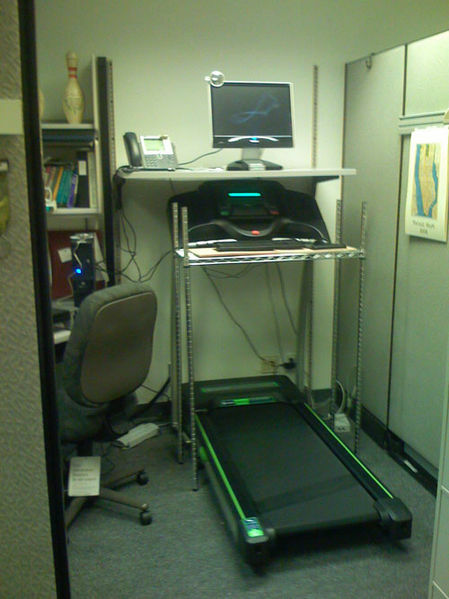 Ask your doctor if a treadmill desk would be something that might prove beneficial to your health. Even if someone can’t work at this kind of desk for 8 hours per day, any amount to start is beneficial. Significant weight loss was shown in people who only worked on the walking desk for 2-3 hours per day. 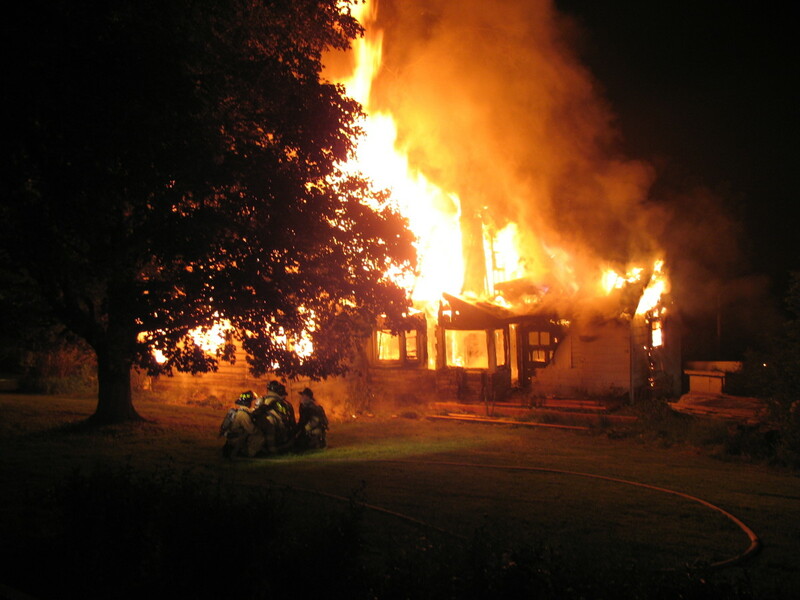 The important thing to remember is that as in any new routine, there is a learning curve. It’s recommended to get used to walking on the treadmill a bit before attempting to work on it but the learning curve is usually very short for most users. Some users do increase speeds and go up to 3 to 3-1/2 miles per hour while working so it is an individual preference and literal “balancing act” as to what you can accomplish. Certain jobs such as medical transcription might prove a challenge if using a walking desk, but this author could testify that much of that would depend upon the individual MT's hand, eye, ear, foot coordination. There are many transcription programs that do not need a foot pedal to use and instead operate by use of keyboard shortcuts or hotkeys. This would make a walking workstation a viable alternative for a transcriptionist with certain health issues who still wanted to remain in the industry. This author wonders if insurance would cover these types of desks if they were recommended for patients with specific types of problems or if folks being retrained in the workforce would qualify for therapeutic modalities such as this kind of desk. On questioning my own physician about this type of workstation, he had not even heard of it. It does warrant discussing in medical circles. It’s also worth asking whether this type of work "rearrangement" would be beneficial to anyone suffering from back problems or problems related to a sedentary job. It would keep people employed in the career for which they trained. 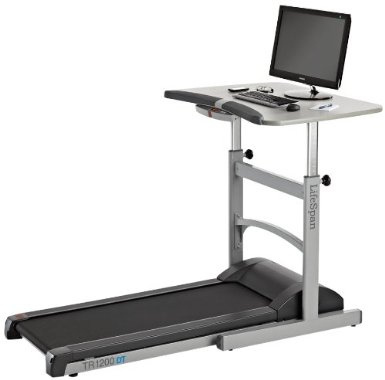 One manufacturer, TreadDesk, reportedly sold 2800 walking workstations in 2012 which is 50 times more than when it launched this product in 2006. CEO Jerry Carr states that sales have increased tenfold in the last 2 years. Some users have voiced complaints such as sore Achilles tendons, shocks from static associated with the machinery, and low back pain. As in any new exercise program, it’s important to start slow, know your limits, and not overdo. If there is the availability of a machine in your area to try before purchasing, it’s recommended that prospective buyers try one out first. Physical therapists and occupational therapists are usually very up to date on the latest products in ergonomics and workstation applications. They could be a great knowledge base for information on the kinds of workstations available and how to use them properly. Remember that any exercise routine is only as sound as the user. If you tire of using this type of workstation, of course, results will decrease and the benefits will not be realized. However, this author feels that this is a viable alternative to traditional workstations in the ever growing world of sedentary lifestyles in both the office and at home. Very interesting. I wish I had one of these at work. Thanks for a great Hub. Nicomp - now that's hilarious~ Good plan! Dangle a Snickers bar on a fishing pole just beyond the desk. I'll walk and work. I think it's worth a try, Om~ Especially if you go really slow~ I'm going to try it here one of these days soon I hope. Let you know how that works! Treadmill desk? Wow!!! Well, it could be great for some but probably not for me. I usually consider myself to be pretty good at multitasking, but I'm not sure if I would want to walk on a treadmill and write a hub at the same time. Anyway, thanks for the info. It was an interesting read! Pumpkincat - thanks for stopping by - and yes...as long as you don't injure yourself it's a great thing! I think it's a great idea! Our lives are much more sedentary than they were 20 years ago, it's very sad. After awhile using the treadmill desk, you could be so fit you could pay half of your electricity bill and cut down on healthcare costs (as long as you don't injure yourself). Hey Leah: Good luck--I'm going to have my hubby try a shelf on my stairstepper/elliptical as you can make it flat--I think the key is flat and slow speed~ Hope it works for both of us! How funny, BJ--they would not try to hop on...I don't THINK but hmmm...they would probably just look at me and begin to howl...and then I'd lose my train of thought (that train has left the building long ago) and probably stumble and hit my face on the shelf of my desk, and in my agony, fall backwards off the thing breaking a hip. On second thought.....if I buy one or have Bob rig one, I may have to leave my mals outside the window howling at mom walking "without them."